This inward season of being is a fundamental time to nourish and restore the body. Following the seasonal rhythm of shorter, darker days, it’s the ideal time for establishing a consistent, indulgent evening routine that balances both physical body and mind while providing deeply profound benefits that support overall wellbeing. While there is plenty that we anticipate resolving in our lives, creating space for rituals and routine habits helps us to navigate our individual journeys with more intention and ease — putting ourselves and our wellbeing above all else. Following a season of giving, this is our time to receive and enjoy gifting that time back to ourselves. As we all strive to visualize what that looks and feels like, we’re sharing a few of our most treasured rituals that enable us to slow down and take great care towards our personal wellbeing. Stay curious, remain committed, and stick with what feels good — physically and intuitively. Come spring, we’ll all be humming. GUA SHA | A facial treatment technique using a naturally cooling and thoughtfully designed stone tool that helps to reduce puffiness and dark under eye circles, improve blood flow and skin tone, promote lymphatic drainage, and tighten pores. For ease of gliding across the delicate facial tissue, applying a facial serum prior to gua sha is ideal, allowing the nutrients from the oils to penetrate more deeply into the skin. We love to finish this ritual by gently massaging a facial serum or balm to deeply moisturize dry winter skin. Hold the gua sha tool with the curved side to your face and glide it gently up and out, starting with the neck, jawline, chin, and around the mouth, between three and five times per area. Then, sweep across cheeks and gently glide under the eyes, across your eyebrows and from your forehead up to your hairline. You can place the stone in the refrigerator or freezer to assist in further reducing inflammation. The stone is naturally cool to the touch already, but the extra reduction in temperature can increase its many benefits. DRY BRUSHING | Your lymphatic system is responsible for removing the waste from your cells and blood but unlike your cardiovascular system, it has no pump! Que the dry brush — an incredibly powerful tool to boost your immune system, tighten and tone your skin, and promote lymphatic drainage. This is super stimulating, so we recommend brushing before your morning shower (but of course, it’s whatever works best in your daily routine). Start at the feet and brush in long, smooth strokes up the legs towards the heart. Stop at your joints and brush in circular motions, especially in places where your lymph nodes are located, for example behind the knees, inner thighs, and in your underarms. Continue up your body, brushing up your thighs, moving to clockwise motions on your abdomen and chest, and then up your arms again towards your heart. If you can, brush up your back and down your shoulders accordingly. You want to continue brushing each appendage until your skin is the tiniest bit rosy, the whole process should take about five minutes! 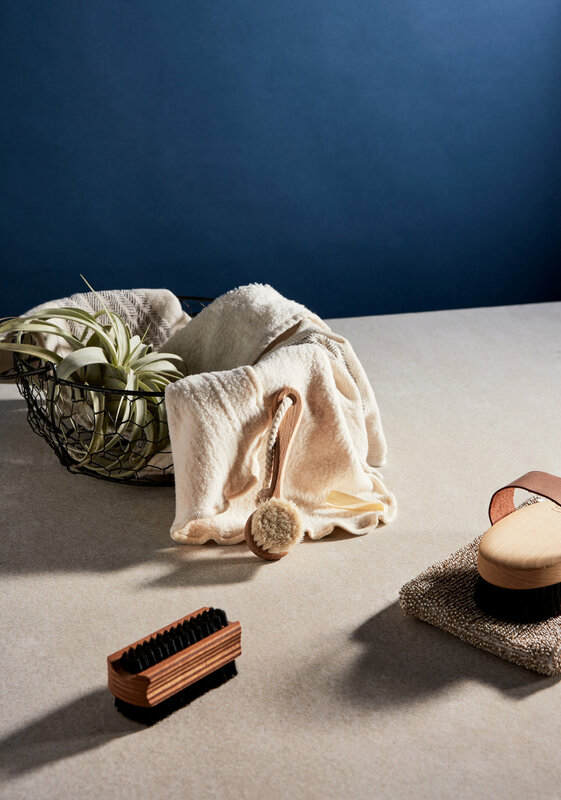 BATHS & FOOT SOAKS | For supporting circulation, promoting gentle detoxification and to relax and calm the body and mind prior to a restful night’s sleep, evening bath rituals are one of the most truly indulgent experiences that you can create in the comfort of your own home. Soaking in magnesium bath salts further relaxes tired joints, and eases menstrual discomfort (especially around ovulation or at the onset of pre-menstrual symptoms) by flooding the body with essential minerals needed to function properly. For those experiencing the onset of a cold or flu, our preferred mustard bath blend is ideal in helping to support the immune system while leaving accumulated toxins behind. Additionally, it’s an incredibly grounding and soothing ritual after extended travel when exposed to airborne toxins or unwanted environmental factors. Alternatively, foot soaks are also incredibly supportive for drawing toxins straight from the body and in times when a tub isn’t accessible. Simply fill a large bowl or foot tub with a few scoops of magnesium salts or the mustard bath and soak your feet for at least 20 minutes, following up with warm insulated socks before slipping into the sheets. Light candles, burn some palo santo or smokeless incense, diffuse your favorite blend of essential oils, and play soft background music if preferred to create your own luxurious spa-like experience that reminds you to slow down and encourages you to come back for more. EVENING ABHYANGA + SELF MASSAGE | Inspired by ancient Ayurvedic practices, abhyanga is a self massage ritual using warming herb-infused oils to nourish and restore the body on a very deep, cellular level. Traditionally performed after dry brushing, the oils help to lubricate the joints, increase circulation, stimulate the internal organs (including digestion), assist in elimination of impurities, aid in detoxification, calm the nerves, support deep sleep, and impart muscle tone while firming, softening, and smoothing. Maintaing a consistent abhyangha practice takes a bit of time and patience, however the effects are deeply profound. We prefer the incredible Jiva Aphoa oil blends for this technique, as the scent they leave behind on the skin lingers and soothes a calming mental state. Use long strokes on the limbs (arms and legs) and circular strokes on the joints (elbows and knees) and always massage toward the direction of your heart. Massage the abdomen and chest in broad, clockwise, circular motions. On the abdomen, follow the path of the large intestine; moving up on the right side of the abdomen, then across, then down on the left side. Finish the massage by spending at least a couple of minutes massaging your feet. Feet are a very important part of the body with the nerve endings of essential organs and vital marma points. Then, sit with the oil for 5-15 minutes if possible so that the oil can absorb and penetrate into the deeper layers of the body, followed by a warm bath or shower.